The Mystery of the Talking Trees. For nearly a year I've been following a tree without knowing its name. At first I called it Ffreda for want of a proper ID. But it didn't really fit. She's may be tatty and worn but she's more distinguished than that. She turns out to be called 'Monterey'. I know because I asked the men who were cutting down yet another of her kin-trees on the other side of the road. I popped up beside their van while they were having a tea-break. Kindly they wound down the window and answered a few questions. What are they? 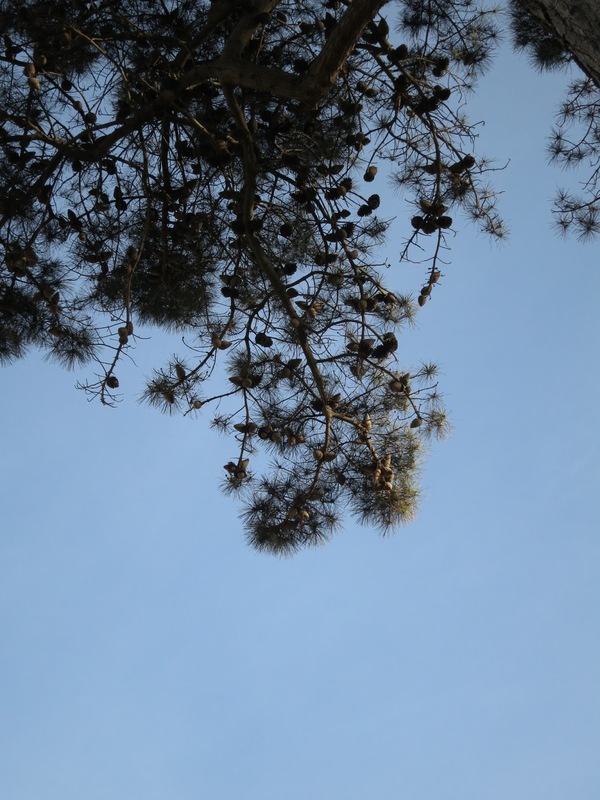 Pinus radiata - Monterey Pines. I would never have guessed. When I look for examples on line I find trees with a completely different shape and more branches. There are photos of some which look a bit like ours. They tend to be on the South Coast of England where they get wind battered and re-styled. Despite that, they live. Why is this particular group in so much trouble they are dying? Several reasons, said the men. The wind. Salt in the air. Last year the winds were tremendous. The weather is calmer now but those old gales are still taking their toll. And there's fungus in their roots, they said. They told me its name. I forgot it instantly. Sorry. But it was their tea-break. I couldn't go back. Take Global Warming seriously, they said. 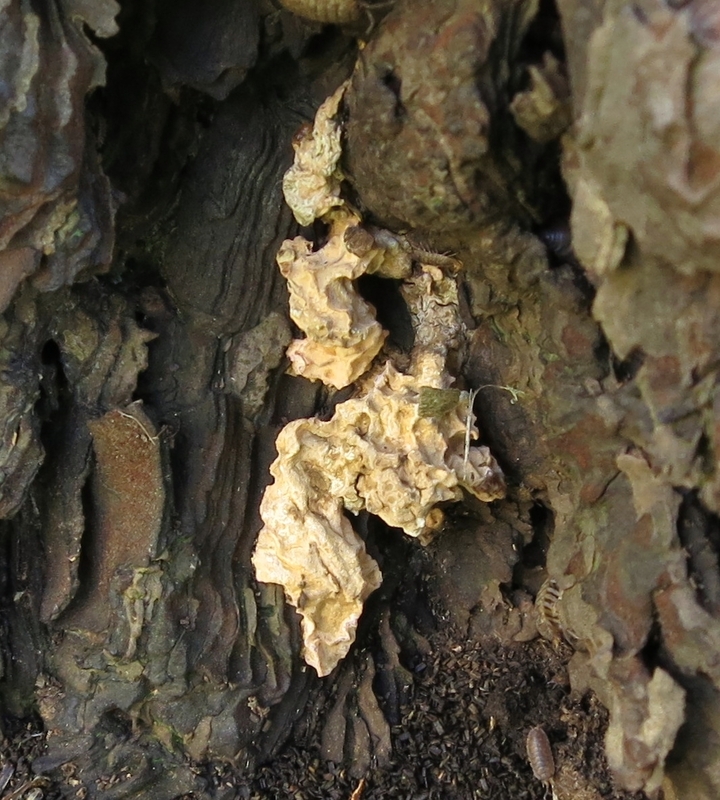 Fungus on the bark at the foot of the tree we're following. Then . . . and this is where I find my imagination gripped . . . there's the road. Cut out from the picture above. These Monterey Pines are either side of a road at the entrance to a housing estate completed just over fourteen years ago. Before that it was a narrow corridor of rough, wet ground between older houses. In order to insert new ones into this gap the ground first had to be cleared and drained. So now it's a long, thin, one-road estate. When the houses and flats were built tree roots were disturbed and broken. And the ground level was raised. This too, said the men, was a problem. All together; wind, salt, broken roots, fungus and ground level change. It's tough being a tree; you can't simply get up and move to somewhere else when your life is threatened. You have to stick it out or . . . not. "You can see it in their rings," they said. So the next day, when the van had gone and the men had carted the saws and trunks and branches and logs away . . . I went back to look at the rings. This is the trunk of the latest tree to be felled. 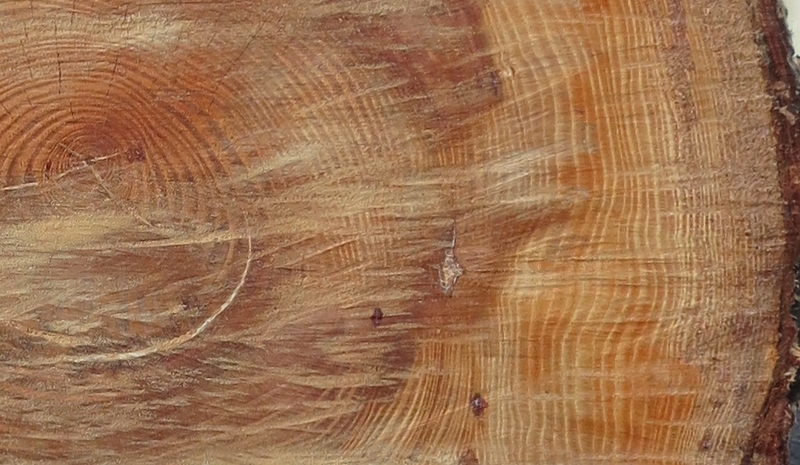 You can count the rings of a tree to tell its age. Each year tells a tale of the year. If all is well with the tree, the wings are wide. If it's suffering from drought or stressed in other ways, the rings are narrow. With this tree it's clear. The rings suddenly go from wide to pinched. The ground is being disrupted. The tree tells when the building works began and from which they have never fully recovered. "All the trees we fell here are the same," said the men. So, what about the tree we're following. For all that it's tatty. For all that some of its branches have gone - how come it's still there? I asked. But the men didn't know. But they are only dealing with failing trees. They won't have time to potter around examining irrelevancies. So I'll offer a couple of hypotheses. In terms of metres and feet, the tree I'm following is hardly any distance from those felled. Perhaps the road between them creates a bit a of a barrier against the deadly root fungus? I'll put that in as a 'maybe'. But what about raising the level of the ground. Where does that fit in? On one side of 'our' tree, the trunk sticks straight up out of the earth. As a groove was made for the road; earth and stones were chucked aside to make space for hard-core and tarmac. More would have been displaced when the sewage pipes and telephone lines were put underground. Maybe some was taken away? I don't know. But some was left - and the ground around the trees made higher. Trees need 'toes'. Not that they are really 'toes' - it's just that they look like toes to me. 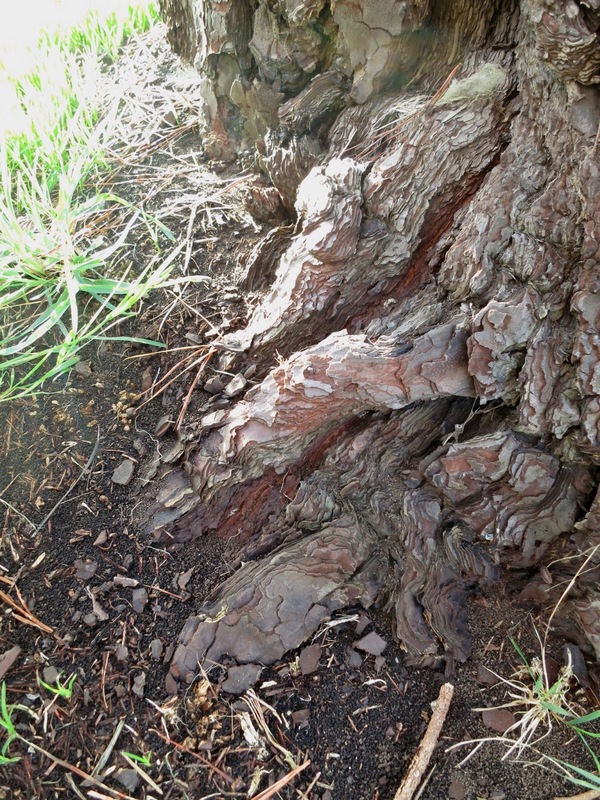 Officially, these woody roots splaying from the base of the trunk are called 'tree flares'. They look as if they should be under the ground - but they aren't. They really aren't. For the health of the tree they have to be on the surface. They are meant to travel a bit of a distance from the trunk then dip into the earth. Maybe Monterey Pines are an exception. I don't quite know how to find out. But until someone says they are unlike other trees and don't need flares after all, I'll assume they do. I scouted around. The flares are missing. The trunks of most of these trees rise straight from the ground like round, unsupported pillars. On the opposite side of 'our' tree, there are 'toes'. Are these toes helping the tree live longer? I don't want to be over optimistic. Our bashed and battered tree is unlikely to live for years and years longer than the others in the group - but for all the time I've been following it I've been mystified. I chose it because it looked in worse condition than the rest. I thought I was making a record of it before all its limbs blew off and the council took its remains away. But that's not how it's worked out - the trees I though most healthy are dying first. When, as I suspect it must be, this tree will eventually be felled . . . I'll have to remember to examine its rings. More about the way trees should be planted and their tree flares. 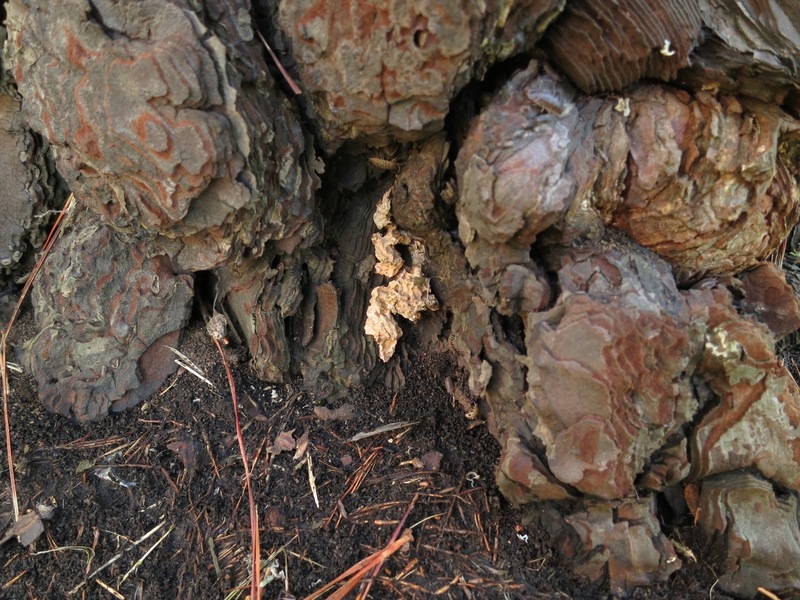 More about the root systems of trees. Both articles are on the Cape Cod Forest Keepers Tree Care Site. What a fabulous post. And sad - it's always sad when a tree dies or goes missing. Fascinating post, I'm glad you now know the true name of your tree. Your explanation about why so many trees are dying was excellent and it shows that improper construction and care around trees can have tremendously negative impacts. One of the things I often see done by so called "professional" landscapers is the piling of mulch along the base of trees, upwards the trunk a bit. 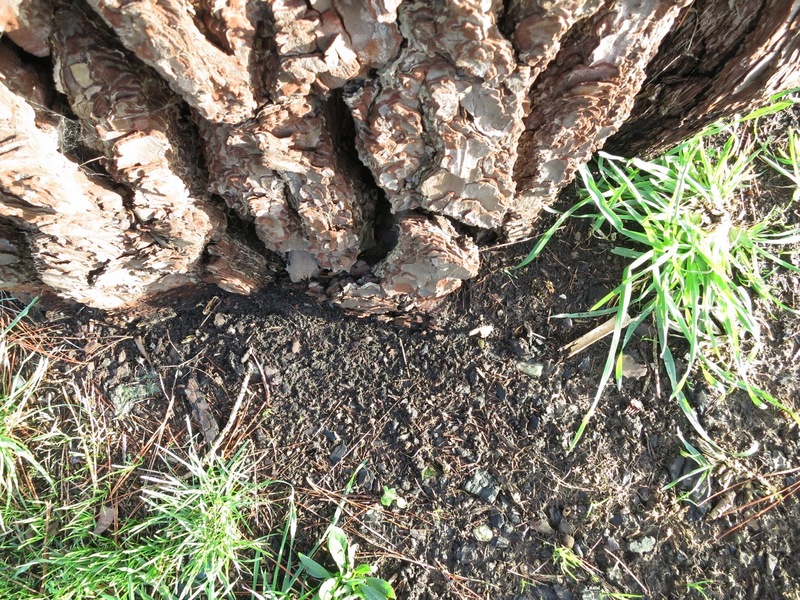 It's a bad thing to do to a poor tree--it sets up conditions for fungus and other types of infections. Very interesting and at the same time rather disturbing - but thank you anyway. what a bit of luck that those guys happened to be there and could unravel a little more of your tree mystery. And what a lucky tree to have kept a toe or two! thanks for good clear advice about planting and pruning trees in your first link. thoroughly enjoyed this post Lucy - nice to have a name after so long and for all that detail. It's been an eye-opener to me that not all of our council tree surgeons are just chain-saw massacrists. Some willingly talk (to)trees! Like the other commmenters I found this a fascinating, and interesting post. Clearly buildings and trees don't always mix unless given room to do so, and the right species chosen. That's a lot of good information! I'm glad you were brave and got them to interrupt their tea break to answer a few questions. Now I'm curious to see more of these trees to see how much they resemble the monterey pines I've seen in in Monterey California. Although I didn't know for a fact what the purpose of those flares were, I had taken a guess and I am pleased I guessed right. I worried last year when I noticed my Abies koreana (new to the garden) was oozing last year and found out too that it's natural. Phew!